Cutting to size is usually the first step in the production chain. 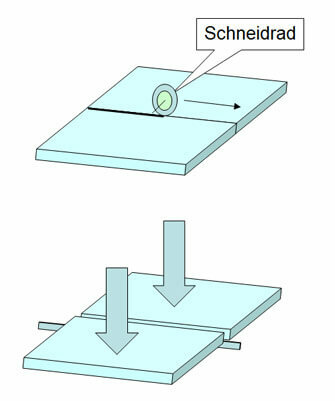 Here Schröder is able to process glass plate measuring up to 3210 mm long and 2250 mm wide. Glass thickness ranges from 0.55 to 19 mm. 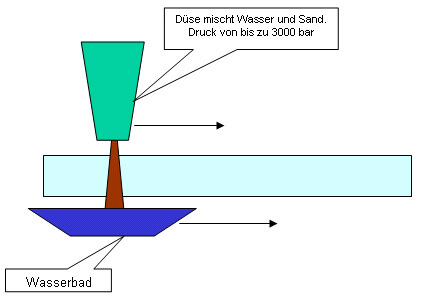 In this process, a high-pressure water jet to which an abrasive (special sand) has been added effortlessly cuts a wide range of materials, even of high thickness. Water-jet cutting is ideal for cutting glass. With this method, it is possible to give the glass contours and shapes that conventional cutting techniques are unable to achieve or only with great difficulty. A big advantage of water-jet technology is that it is a cold cutting process. Unlike other machining methods, the material is not exposed to any thermal stressing at all.